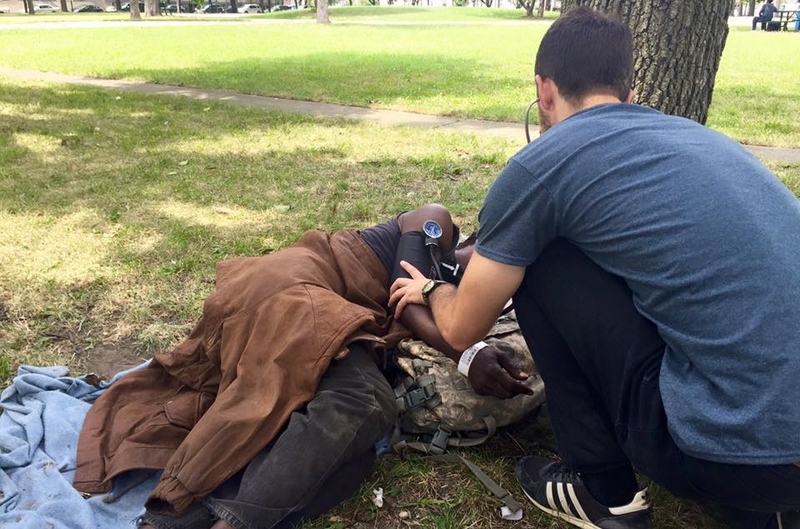 Street Medicine Detroit visits a local park to provide mobile care to homeless men & women. You don’t have to wander far from the Wayne State University (WSU) campus to witness the enormous homeless population in Detroit. Less than a mile from WSU and the Wayne State University School of Medicine, sits the Tumani Center of the Neighborhood Service Organization (NSO). This building act as the only 24/7 warming station during frigid Detroit winters and is also home to the student run and founded organization, Street Medicine Detroit. Street Medicine Detroit is a program of Wayne State University dedicated to providing compassionate and quality medical care to Detroit’s homeless population. 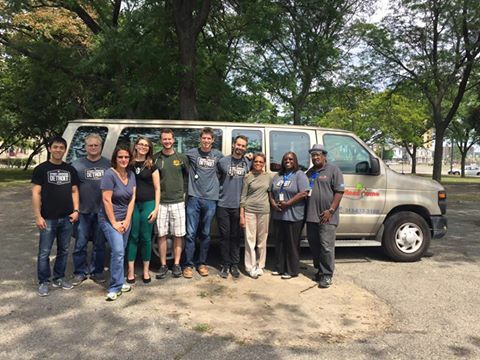 In May of 2012, a group of WSU students teamed up with the NSO to start up a mobile health clinic meant to provide care to Detroit’s homeless population, and inform students how to do so. “Street runs” are the trips taken by mobile care teams in search of homeless men and women that may require medical attention. The mobile care teams consist of Street Navigators, Nurse Practitioners and first and second year medical students. Students are supervised by Clinical Nurse Preceptor Dean Carpenter, RN, FNP-BC. Small interventions can make a large difference to patients; the team is able to provide primary care as well as referrals for social services or specialist care. The homeless population of Detroit was last estimated at over 20,000, many with unresolved medical needs. Packing up at the center, the team gathers orange backpacks full of first aid gear, water bottles and a couple of prescriptions. We load into a van and head out into the city. Certified Peer Support Specialist (CPSS) Phillip Ramsey, a “street navigator” who is familiar with many of the homeless men and women of Detroit and the places they stay, drives the van. Pulling up to a park, we do something that most people are not likely to do: get out of the van and deliberately approach those sitting and lying in the park. One man, sitting on a bench in the park, is approached by a team consisting of an RN and a medical student. RNs are the team leaders during street runs due to their experience and wide range of medical capabilities. The nurse gently and methodically asks him about concerns, with no trace of judgment or pity, only dignity and compassion. The medical student occasionally breaks in with questions as he fills out his form, asking if he’d been seen by a team member before, which prescriptions he’s been prescribed, when the last time he’d received medical care was, where he sleeps at night, and so on. The conversation is relaxed, lengthy and ultimately leads to a full picture of his current medical state and what could be done to address it. His health concerns sound like anyone’s: stress, getting enough sleep, worries of chronic illness. He has a small wound on his ankle that the nurse examines, it is healing well. His sock shows the mark from when it was fresh. He asks if we can get him another pair of socks, the nurse says she will come back with those in order to avoid infection. Meanwhile, second year medical student August Sigelko takes the lead in approaching a man lying down by a tree. After greeting the man and learning that the he was in severe pain, Sigelko sits down beside him to record his medical history and ailments. The patient is in so much pain that he is unable to walk and shifts uneasily from one side to the other every few minutes. Today, he has only eaten half of a sandwich that a friend was able to bring to him from a nearby rescue mission. His pockets reveal that he has prescriptions from a recent Emergency Room visit to obtain his necessary medications. However, he lacks both the money and the proper identification to fill the prescriptions. Over the last week, drug dealers have been approaching and selling to him frequently with promises to lessen the pain. He is referred to the on-site CPSS, who will work with him to track down the proper paper work, as well as determine how else he can be assisted in terms of housing and care. The patient expresses concern for his own safety at night and at one point shows the student his knife. With permission, Sigelko takes his blood pressure and notices that it’s higher than it should be. Ivy Carson, a local Nurse Practitioner who was involved with Street Medicine Detroit as a student, offers to teach Sigelko how to listen for the patient’s heart murmur when the patient mentions it. She also leads by example in teaching bedside manner when the patient gets emotionally distraught. Team leader Carpenter overlooks the process and fills what prescriptions they have available in the orange backpacks. We reconvene at the van, load back in, and head off to the next site. At the end of the street run, we return to the center, where the students input the information into the database to improve continuity of care through recordkeeping. It will be easier to help the same people in the future if they already have a record available. The program is popular, with no shortage of student interest. No doubt it provides a rich educational experience, not likely forgotten. Homeless men and women rarely get the care they need, and when they do, it can often come with a lack of understanding from the health professionals meant to serve them. There are countless social determinants of health that bar homeless men and women from improving their health. Unfortunately, that isn’t something that every student can learn in a traditional classroom. Therefore, it is incredible to witness our future healthcare workforce in Detroit learning not only to provide compassionate and judgement-free care, but to do it in a way that is thoughtful and cohesive. To learn more about Street Medicine Detroit, or to donate to their efforts, visit http://streetmedicinedetroit.org/. Is your team doing creative work that impacts students or your community in a unique way? Contact Stacie Longwell Hill at [email protected]. Education to Practice is a service of the Michigan Health Council, a 501(c)(3) nonprofit organization dedicated to creating a culture of health with health professionals at the heart of the delivery system.